Auditor training services gradiently make one more capable in life.Each course and internship builds on the preceding and makes an individual more and more confident and able. Skills gained by training in the discipline of auditing are the superior skills of handling life. With them one can undo the pain,misery and failures of others and this has never been possible in history. The proficient auditor is valuable beyond compare to his fellows, to the world and to himself. An impulse to help resides in nearly everyone. Auditor training gives one the know-how to provide help of a higher order. An auditor is the only person in the world capable of actually undoing unhappiness in another. He is the only one who can help others restore their native powers. No better way to help exists, and no activity is more rewarding. 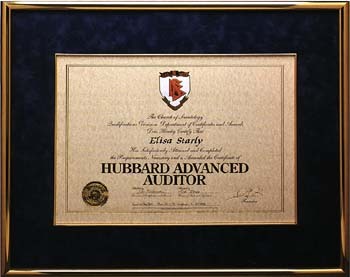 The successful completion of a Scientology training course is validated with certification. When one has passed a thorough period of internship, he earns a gold seal signifying that his certificate is permanent.